← Holder: Worst AG in US history for journalism? Waud’s courage is all the more impressive when you consider how impossible it was to not be in constant danger from the hundreds of thousands of inaccurate bullets and cannonballs shot by the tens of thousands of soldiers fighting for 3 days in narrow confines. 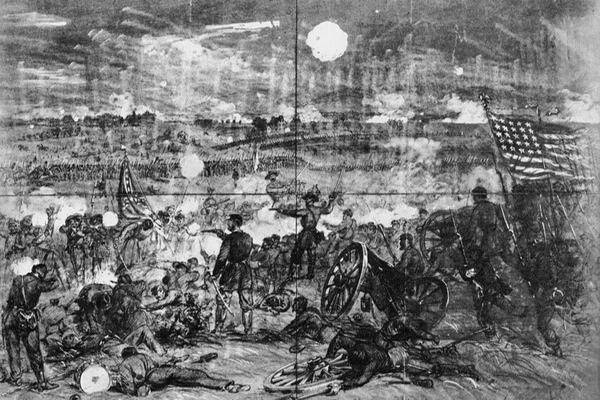 Nonetheless, hundreds of participants’ recollections of Gettysburg have been found and the battlefield is largely unchanged, so the likelihood of deducing anything new and accurate about distance from a sketch is virtually nil. The Kentucky professor would spend his time better working on some of the lesser known important aspects of the campaign, such as that Lee’s army kidnapped every black it found, even those with documentation they wee never slaves or residents of the south, and sold them into slavery. With so many southerners still pretending the Civil War was not about slavery, it would be a useful reminder. Or perhaps the professor could write about the absurdity of the US Marine Corps Museum being on Jefferson Davis Highway, which honors a racist traitor who was responsible for more US soldiers dying than Hitler, Ho Chi Minh and Bin Laden put together.